In courtship utters a mellow “poo-eee-chk,” also has a rasping, shrill type of a call. Description: Sexes similar. 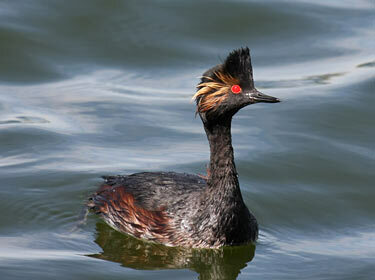 Breeding adult with blackish head, neck, upper breast, back and wings; shiny golden ear plumes fanning out behind red eyes; belly white; bill short, slim, upcurved and black. Winter and immature birds dark gray-brown above including crown and hindneck; much of neck and cheek dingy gray-brown blending to white behind ear. Habitat: Rivers, lakes and reservoirs during migration. Breeding occurs on shallow ponds, marshes, and lakes rich in submerged aquatic plants. 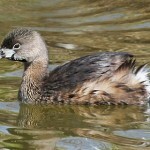 Where in Nebraska: In spring and fall a common regular migrant in the central and western portions of the state. A common breeder in the north and west. A rare casual summer visitor in the south. Best locations for viewing during the breeding season are Sandhills lakes with scattered emergent vegetation. A colonial breeder and nest in colonies of a few pairs to 100’s of pairs. 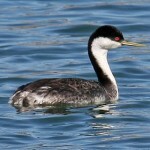 Field Notes: May ride high on the water or low like most grebes. Often nest in colonies. 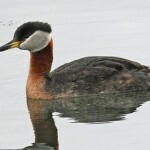 Fun Facts: On cold, sunny mornings the Eared Grebe sunbathes by facing away from the sun and exposing its rump, exposing dark underlying skin to light.